If you fly into Langkawi, you can see the full stretch of this magnificent sandy beach below on your right as the aircraft gets close to the island for landing. 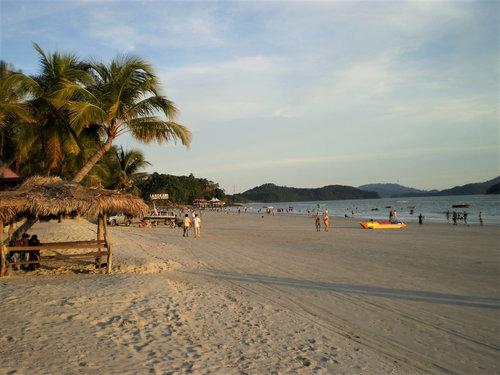 Pantai Cenang beach is a 2km long stretch of white sand located on the western shoreline of Langkawi. This is the most popular public beach to both tourists and locals. Why? Because this long beach with its gentle curve is the prettiest beach in the whole of Malaysia. With palms, coconut and other trees fringing the beach, it offers awesome view of the ocean and the islands close by. You can find all kinds of watersport activities from various points along the beach. Series of hotels and resorts of all kinds have come up along the beach and many of them have chalets right on the sand. The road Jalan Pantai Cenang runs by the beach. You can access the beach from this road. Since there are hotels close to each other along the entire stretch, you will need to find a sandy passageway between the hotels to get into the beach. I have observed that even if you access the beach through one of the hotel properties, nobody really minds. It has become somewhat acceptable in this part of the island. As you get to the beach, look to your left (i.e. south) and you will see a big board perched on the hill at the far end that says "Langkawi". That is the cliff which separates this beach from its southern extension known as Pantai Tengah Beach. There is a restaurant on top of the cliff which is known as The Cliff. If you look towards right (north), the beach stretches as far as you can see. Beyond the beach limits, you can reach the lovely rain forests. So what can you do while on the beach? Pantai Cenang is a great beach for families. The beach is generally clean and the water is great for swimming. If you are interested in sunbathing, you can rent beach or lounge chairs and umbrellas right on the beach. Almost all the beachside hotels and resorts offer such rentals. This beach is popular to the Europeans and other foreigners. There are also kiosks on the beach offering snorkeling, boat rides, jet ski, banana boating and even parasailing. During the tourist season if you look at the sky, at any point of the time you will see several riders on the parachute parasailing from a motorboat. The jetski riders are advised to stay within limits and not go close to the offshore reefs and islands. You can take a boat ride from here to explore the nearby islands that you can see from the beach. Two of such islands are Pulau Rebak Kecil and Pulau Rebak Besar. In fact during the low tide, you can walk down to Pulau Rebak Kecil, but be careful, the tide remains low only for couple of hours and you should be back in time or else you can be in trouble. Pantai Cenang Beach is also well known for the fantastic sunset views. So if you come to the beach in the afternoon, stay back to see how the sun sets at the backdrop of the islands at far. During this time while the daylight is still there, you will often find the locals and families playing volleyball on the beach. You can join them and play a game or two if you so like. The loose sands start right from the roadside and continue towards the waters for some 30 yards or so. The beach area close to the water is hardened and you can comfortably walk on this part of the beach. You will often see cars and jeeps being driven close to the water. Another great attraction for visitors here are the large number of shops, stalls, restaurants and spas lined up along the beachside road (i.e. Pantai Cenang Road). You will get all sorts of things here including clothes, jewelry, gifts & souvenir items, accessories, and almost anything that you can think of. There are lot many restaurants both budget and upscale that offer all kinds of dishes including local Malay, western, seafood, Indian, Arabic and even fusion cuisine. The entire beachside is a vibrant place full with glittering shops & eateries. In fact there are several beach bars right on the Pantai Cenang Beach which stay open till late in the evening. One of them is Babylon, another one is Little Lylia's, a reggae bar which is our personal favorite. With music, bar-be-que and drinks, you can have a great time on the beach. There are of course other formal bars & restaurants along the roadside. There are no public toilets or changing facilities at the Pantai Cenang Beach. However in case of emergency, you can access the toilets of the nearest beachside hotel. I have not heard or seen any one being turned down. 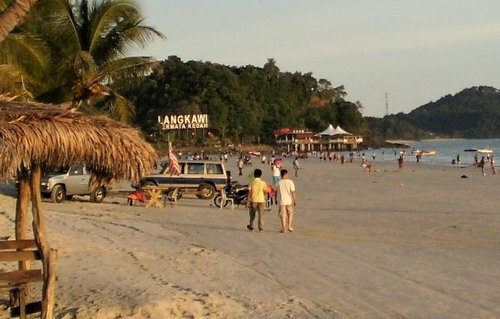 Pantai Cenang Beach is a family beach vibrant with activities and tourists. This is one of the longest and most beautiful beaches in the island, and great for swimming, sunbathing and watersport activities. During the high tourist season (October to May), the beach can really get crowded. During such time you can go early in the morning when there is hardly anybody there and enjoy the beach. A word of caution: Do not let your kids go swimming deep into the water and keep them close to the beach. There have been a few cases of accidents when the unmindful jetski riders have driven their ski-boats over the swimmers and snorkelers. Update April 2017: Swimming area in the waters at Pantai Cenang Beach has been clearly marked. The Jet Ski operators ensure that jet skiing is done beyond the marked area and all seem to follow that. So as long as one is swimming within the marked area, it should be safe. However there continues to be 4-wheel vehicles being driven up and down the beach. With many shops and restaurants around, you can also spend a great time here strolling along the Pantai Cenang Road, and have a great lunch or dinner. Many budget restaurants here allow you to buy beers from the shops and drink at the restaurant while you take the food there. Pantai Cenang Beach is a public beach, accessible 24 hours and there is no entry fee. 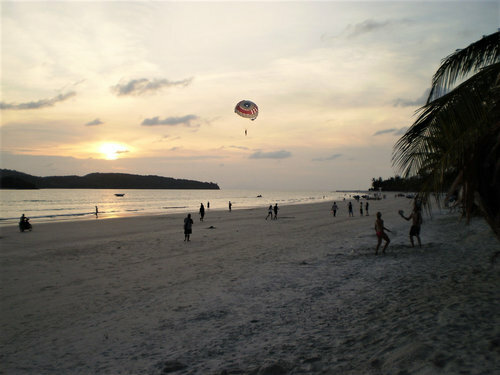 Pantai Cenang Beach is located on the western shoreline of Langkawi and by the side of the road Jalan Pantai Cenang. It is about 18.5kms from the Kuah Town and a 15 minutes taxi ride from the International airport located at Padang Matsirat. There is a bus service to Pantai Cenang which is quite irregular though. If you are staying elsewhere in the island, you can easily come to the beach by a taxi or a rental car. Taxis are available in plenty along the road for getting back. You can also flag down an empty taxi as it passes by. 1) Pantai Cenang Attractions: All the nearby attractions in the same area. 2) Pantai Cenang Guide: All about Pantai Cenang including activities, hotels, restaurants, shopping, nightlife etc. Hi, may I know that is there any public bathrooms provided at Cenang beach due to our hotel is far away from the Cenang beach. Please advice thanks.